MacGregor, part of Cargotec, has signed a contract that will extend its deliveries of Hatlapa deck machinery to a growing series of ultra large container carriers (ULCCs) being built at three shipyards across Asia for the global container shipping organisation, COSCO Container Lines. The latest contract was signed in the first quarter of 2016. Currently eleven vessels, varying in size between 19,000 and 20,000 TEU, are contracted to be fitted with MacGregor's Hatlapa deck machinery. Six are being built at Nantong Cosco Kawasaki Shipyard (NACKS), three at Shanghai Waigaoqiao Shipyard (SWS), while the most recent confirmation of orders is for two vessels now under construction at Dalian Shipbuilding Industry Co (DSIC). "COSCO is one of the world's leading container carriers and it is a great honour to continue our strong relationship with this customer," says Nina Priebe, MacGregor Area Sales Manager. "We have been working on this order together with our local team since the beginning of 2015, and the continuation of our deck machinery contracts for these vessels is a notable endorsement for our good local customer support and services." For each vessel MacGregor will deliver the design and key components for shipsets of up to twelve electrically-driven Hatlapa winches. They will have a chain size of up to 137mm (K3) and a pull of up to 320kN. 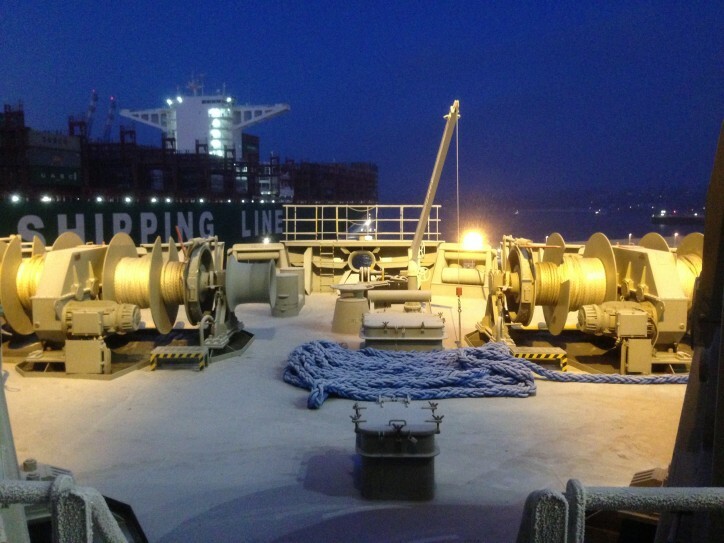 The winches will be manufactured by MacGregor's Chinese production partner, Nanjing Lüzhou Machine Works. Delivery of the first ship-set of deck machinery is scheduled for July 2016 and the final one is planned for delivery at the end of 2017. The vessels will operate between China and Europe. "COSCO knows and trusts MacGregor products and services, and we have secured a significant number of references for their vessels over the years," adds Ms Priebe.